This enchanting thatched cottage is at Emery Down, near Lyndhurst. It overlooks a cricket pitch, where animals graze all week. See further pictures on Lyndhurst page. Boltons Bench, near Lyndhurst attracts many tourists in the summer months, but is ideal for walking in the winter. 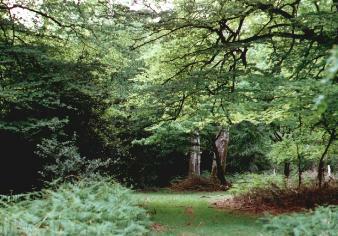 The village of Lyndhurst is the capital of the New Forest. 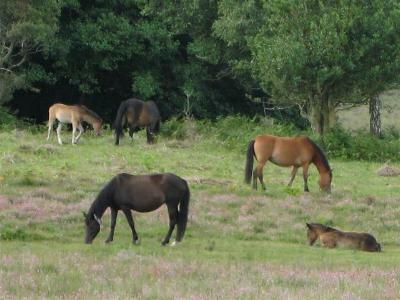 There are many walks in the New Forest where you can be alone for hours and only see the wild-life, including deer. 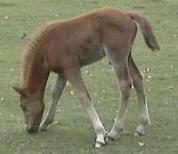 During the Spring and early Summer months most of the foals are born. These animals are wild and should not be fed or petted, as they are likely to give you a solid kick. 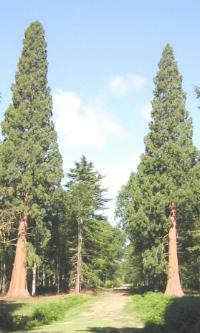 At Rhinefield, near Lyndhurst, there is an ornamental drive, with Rhododendrons, and the Tall Trees Walk, with giant Douglas Firs and Redwoods, giving several walks for the tourist or picnicker. 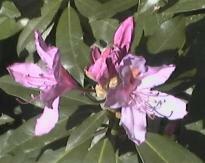 The Rhododendron is a native plant from Asia, and blooms in the UK in May and June. 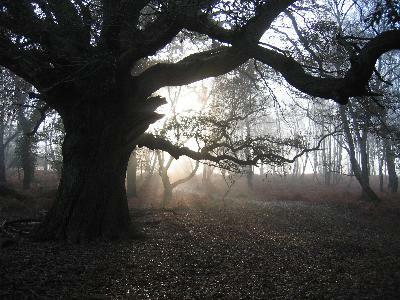 Traditional English oaks form much of the New Forest, with beech, ash, fir and elms. 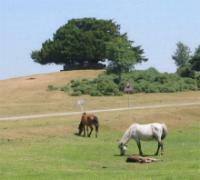 The beauty of the New Forest can be seen every day of the year. 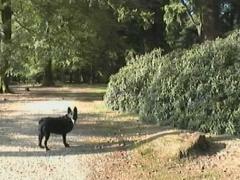 In any event, Lucy enjoys every second she spends in the New Forest! 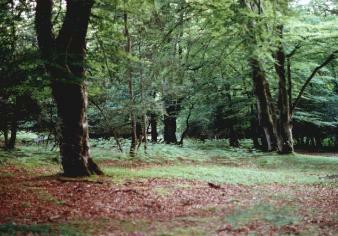 Spring and early Summer provide lush greenery. 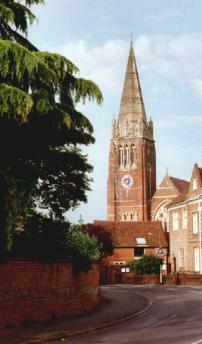 The village of Lyndhurst is the established capital of the New Forest, with local District Council Offices, Forestry Commission Headquarters, Verderers' Court and distinctive Church spire. Notorious for traffic jams in Summer months, it became even worse when in their "wisdom" the County Council imposed a one lane only scheme through the High Street, at a cost of £1 million. 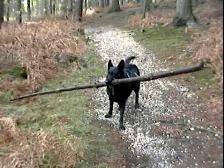 The New Forest is ours for all to share. 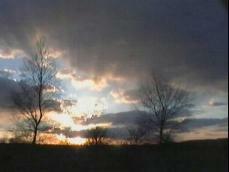 It's beauty is always apparent. 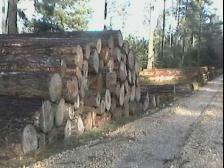 The New Forest is also a working forest with lumber cut and carried away! 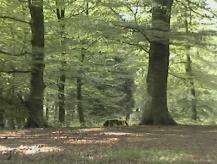 The Forestry Commission are responsible for the care and upkeep of the Forest, although in 2005 the New Forest become one of the National Parks. Trees are felled on a regular basis. The activity does chew up the Forest tracks somewhat. This makes a nonsense of any proposals to restrict visitors or cyclists on the basis that they do damage to the environment! This little fellow was seen in June, and didn't seem at all bothered about me or the dog. 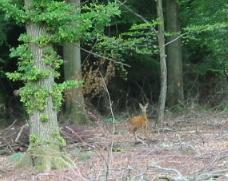 These deer just stared at me for ages and never did run away. 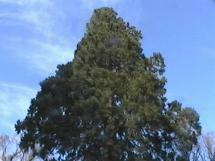 Although we cannot match the giant Redwoods of California, we do have these two huge trees, at about 180 feet. 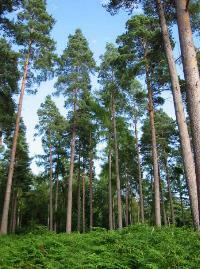 See Tall Trees Trail walk. We saw the real thing during our holiday to America. Link to USA Holiday. 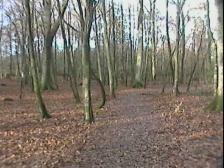 During the winter months the forest is carpeted with a layer of fallen leaves, particularly in this beech wood. 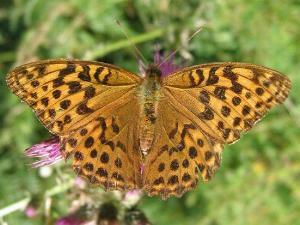 In the months of July and August you can see many different species of butterflies and moths in the New Forest. I managed to take various pictures of wild bees and butterflies. 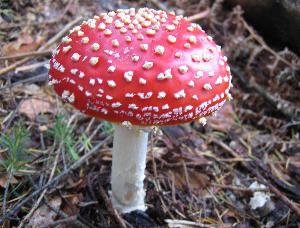 In early Autumn many species of fungi can be found on the heaths and on the forest floor. Click here to see more pictures. Also in the Autumn, pigs are turned out into the Forest to forage for acorns. 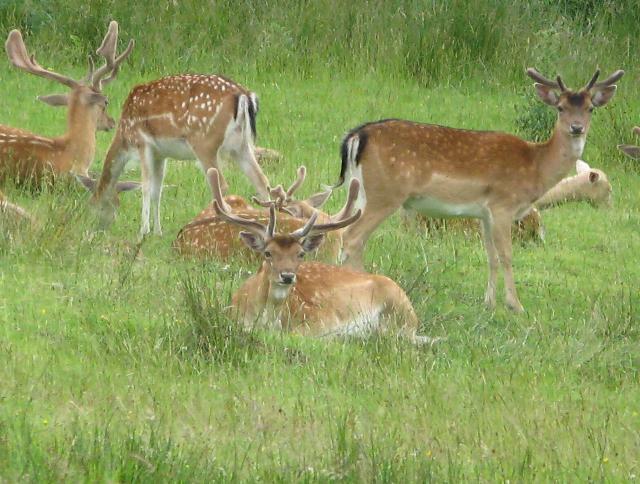 At Bolderwood, near to the car park, is a Deer Sanctuary within the fields of the Keeper's Cottage. There are around 40 animals in the herd. Best time to see them is early evening, from the hide just inside the forest. 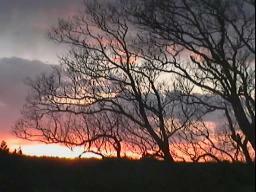 Sunsets at Matley Heath, looking towards Lyndhurst.